Hello, dear reader, I’ve been shivering not just from the cold weather that means our Indian summer is over but at the thought of giant spiders which invaded the UK recently (well Sheffield but Spiders in Sheffield doesn’t have the same ring). So we have our Tardis crew returning back to Sheffield and it’s important to do so because Yaz, Ryan and Graham never expected to be passengers on the Tardis. So what of our three companions? We get an introduction to Yaz’s family and Graham and Ryan return after the death of Grace. Graham is still the most interesting of the three as his grief and loneliness are explored sensitively by Chibbers as we get scenes of Grace out of focus. Grace is there as an exploration of his inner turmoil. 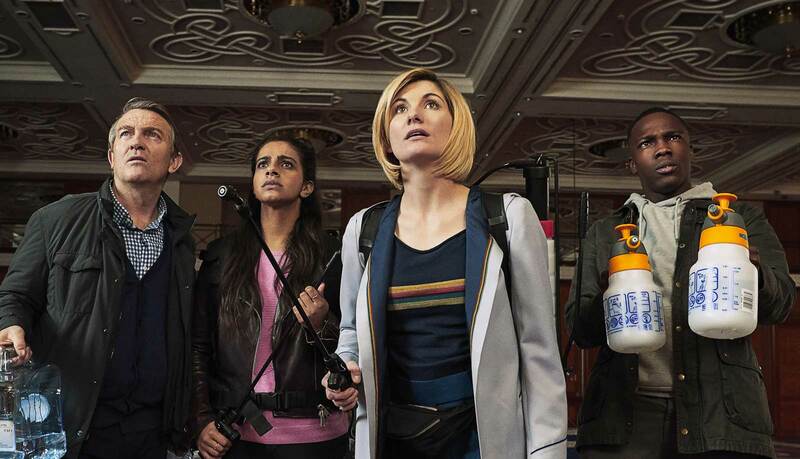 We are aware by now that Chris Chibnall enjoys creating character and backstory but the supporting characters this story offers are definitely the weakest so far this series and I will explain. Firstly Yaz’s family. Her mum seemed to be very interested, for whatever reason, in who Yaz is going out firstly suggesting a lesbian relationship with the doctor and then a relationship with a boyfriend with Ryan. The dialogue is awkward, a bit cringy and not that funny if it was meant to be. Maybe because we don’t see her interacting with her husband initially I didn’t think she was that believable. Whilst having someone who was for a long time in a soap opera does help with audience recognition Shobna Gulati who plays Yaz’s mum doesn’t bring any warmth or freshness with her interpretation. Considering she is playing, in essence, the Jackie Tyler role I didn’t find her particularly strong as an actress, unfortunately. I did however like the young actress who plays the sister but the actor who played Yaz’s father had some poor dialogue in the flat. Who realistically collects rubbish and leaves it in a kitchen? I wouldn’t want to eat anything he cooks and his wife would kick up a fuss I think so I was surprised it was left there. It’s early days but I don’t get a sense of cohesion yet with this family. Yazz is definitely the weakest drawn of the characters but I like her positivity and she could be a really good companion if she was consistently written. She’s written as a police officer but none of those skills seems to help her in this situation which she should be taking a lead on with the doctor. If she doesn’t want to be a policewoman what does she want to be we have no idea. Sang I want more but not explaining it or showing it is poor writing. Other supporting characters either feel sketchy or caricatured. Mr Robinson’s assistant mentioned as his niece’s wife seems a heavy-handed comment to make a PC point which didn’t really have any relevance to the situation and poor Kevin the bodyguard has a shining moment as a sacrifice to the plot. I can’t remember the name of the scientist lady but she seemed a bit dim to not even check that the carcasses were dead and wouldn’t you ensure that your policies on disposal were a lot tighter perhaps incinerating carcasses and treating them as clinical waste. After four episodes it does seem to have become a habit by Chris Chibnall that the villain is not well thought out enough or strong enough to be really effective. The Woman Who Fell to Earth could be forgiven for having a weak monster because we had a fresh Doctor and new companions to meet, The Ghost Monument had its flaws with the selfish Illini but visually looked stunning. Here we are presented with a caricature with just one vocal setting it seems which is unpleasant and cowardly. The Ed Sheeran joke will date this episode really quickly as will the Donald Trump imitation. Mr Robinson comes across as a one-note cheesy villain. It’s a missed opportunity for Chris Noth as he doesn’t have any particularly witty lines which can forgive a lot of things. Whether he was directed that way or not its a shame he plays the businessman without any redeeming features or subtlety. It isn’t very well explained whether there are any consequences for Mr Robinson with two dead bodies in the hotel, a giant spider, and a landfill site underneath his hotel. He shoots the Spider and off he goes put simply to get to the White House. I do admire the ambition to channel traditional themes such as the ecological messages of the Pertwee era’s “The Green Death” but dammit if you’re going to use them at least have some kind of line to say the team can call UNIT to clear up the mess. Loose ends like that should be explained as it makes for unsatisfactory viewing and smacks of laziness. It feels as if ideas are created but not fully thought through. I’m liking Jodie as the doctor but not loving her. I can see that Jodie is working hard at being clever as the doctor but has yet to show her authoritative side but needs a lot of those moments very quickly from now until the end of the series. She efficiently works through the episode and comes up with a solution but the resolution feels a bit shaky as the spiders, presumably we are meant to accept every last giant spider even the ones across the city, are somehow lured to the hotel panic room by a song from Stormzy. If I’m honest this story is the least logical I’ve seen from Chris Chibnall so far this series. If you have watched the Pertwee story the Silurians you will remember how disgusted the Doctor was when the Brigadier blew up the Silurian Base and destroyed them all. Why would the Doctor now sanction that they meet a horrible death especially as they are not to blame for becoming giant spiders and doing what comes naturally to them? There were things to enjoy about this episode. I’m not a great fan of spiders so to see them moving around generally gave me the creeps but they didn’t really do enough that was scary because as an audience member I know how it’s all done as CGI. There was a mystery in the story at the beginning but as the title gives away the threat it’s what you do with the spiders that matter. It’s only partly successful in that respect. What was good was where we saw shots of all the cobwebs and the reveal of what happened to Anna was quite effective. I really liked the ground level views at the beginning of the episode too. The direction at the house with the colour palette of dark browns, shadows and the tone of the scenes adds moments of quiet sadness which punctuate against the more comedic and horror moments of this episode. In conclusion as an episode, it suffers from the same issues with ” The Ghost Monument” in that it doesn’t use the situation presented to its full potential and it needed more development as an idea. Many of the characters lack depth and without a strong coherent sci-fi plot to override those weaknesses, it comes across as an average episode, not a good or excellent one which it had the potential to be.